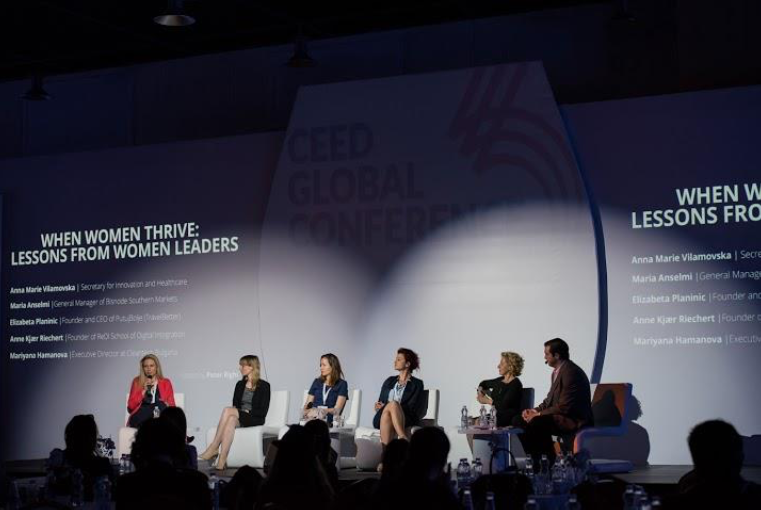 CEED held a women’s networking café event on April 14 2016 as part of the CEED Global Annual Conference. Inspired by “Lean In Circles”, the event enabled women entrepreneurs and leaders to meet, connect, share their experiences and offer support to each other. Riechert, Founder of ReDI School of Digital Integration, and Mariyana Hamanova, Executive Director at Cleantech Bulgaria. These inspirational women spoke about their beliefs as leaders, how they overcame key challenges in their work, and the mentors who impacted them. The discussion revealed a variety of perspectives and triggered conversation and connections between female participants. Over 124 women attended the conference from Romania, Macedonia, Bulgaria, Germany, Croatia, Slovenia, Tunisia, Moldova, Kosovo, Morocco, Serbia, and Albania. The conference overall was attended by over 350 entrepreneurs, investors, and members of the broader business community. Attendants had the opportunity to join an online networking platform for entrepreneurs to create B2B linkages. During the events, 78 women were active on this platform.